Cellular shades (a.k.a Honeycombs) offer a unique blend of decorative style, versatility, and comfort. Their distinctive cellular construction insulates homes against the elements to help reduce heating and cooling bills, and their superior sound absorption will make surroundings quieter and more comfortable. The neutral white backing on all our fabric styles provides a clean, consistent exterior appearance. And, since they’re available in a variety of design styles and applications, they can cover just about any window with convenience and style. 100 % stain-resistant polyester fabric is wrinkle-resistant and easy to clean and maintain-most fabric styles are completely washable. Available in a variety of styles and pleat sizes to fit almost any dimension. Color choices include 200 options from whites, neutrals, and muted tones, to bold colors and exclusive prints. Fabrics range from semi-sheer to room-darkening, offering privacy and light control versatility. The slim yet durable headrail and crash-proof cordlock provide smooth, trouble-free operation. The durable cordless system offers a clean yet safe alternative to hanging standard cords. A wide selection of special shapes and control options are available to fit any need. Our RemoteLift battery-operated lift system lifts and lowers shades with the touch of a button. 3/8” single pleat for small scale windows. 3/4” single pleat for standard and larger windows. 1/2” double cell pleat for superior insulation and energy efficiency. Many styles fit widths and heights of up to 174” with no seams or overlaps. Essence – casual fabric with linen-like look in 3/8” and 3/4” single pleat styles. Opulence – soft, color-rich fabrics offered in 3/8” and 3/4” semi-opaque and blackout styles, and a 1/2″ semi-opaque double cell style. Serenity – room-darkening fabric in 3/8” and 3/4″ single pleat styles provides up to 99% light blockage. Tranquility – an open weave fabric in a 3/4” single pleat style that gently filters sunlight and softens the view. Harmony – double cell fabric in a variety of solids and prints. Texture – subtle, unique textured prints in a 3/8” single pleat style feature in neutral and clean tones. Linen – tone-on-tone linen print pattern in a 3/4″ single pleat style offers added depth and dimension. Prints – decorative paisley, swirl, and leaf-print styles. Decora Double Cell – double cell fabrics with stylish elegance at a great value. Color-coordinated rails and components enhance the shade’s appearance. Our sleek, low-profile headrail allows shades to stack tightly. Its narrow dimension is ideal for shallow mounts. Positive lock tab brackets are easy to install and hold shades securely in place. Swivel brackets, space locks, and extension brackets are also available for installation flexibility. Our honeycomb shades can be customized to fit most any window shape, including arches, angles, circles, hexagons, octagons, and more. Cordless Lift System – Lifts and lowers shades with ease. No lift cords makes them safer for children and pets. Also available with topdown/bottom-up control. Features headrail colors that complement the fabric. Bottomrails color-coordinated with the fabric are standard, or can be ordered to match the headrail color if desired. Continuous Cord Loop – Easily lifts any shades, even large, hard to reach shades, and stops it exactly where you want. No dangling cords. RemoteLift Battery – Operated Motorization – Lifts and lowers shades with the touch of a button from up to 30 feet away. The headrail is offered in while and cream colors. Bottomrails are color-coordinated with the fabric, but can be ordered to match the headrail color if desired. A satellite eye is available to clear top treatments or obstructions. A satellite battery pack is available to make changing batteries easier. An optional AC transformer plugs into a standard wall outlet and eliminates the need for batteries. Two-On-One-Headrail – Two shades placed side-by-side that can be operated independently. Ideal for covering patio doors or large expanses. Top-Down – Lowers the shade from the top down to allow light to come in while maintaining privacy. Top-Down/Bottom-Up – Lifts the shade from the bottom or lowers it from the top, providing complete light control flexibility. A fabric gasket diminishes light gaps between the headrail and moving rail. Two Fabric Combination – Combines two fabrics on the same shade to provide total fashion and light control versatility. Many fabric styles available in widths and heights up to 96”. Arches – Stationary or movable arches to fit most arch window openings. Skylight – Easy-to-operate system covers most skylight applications. 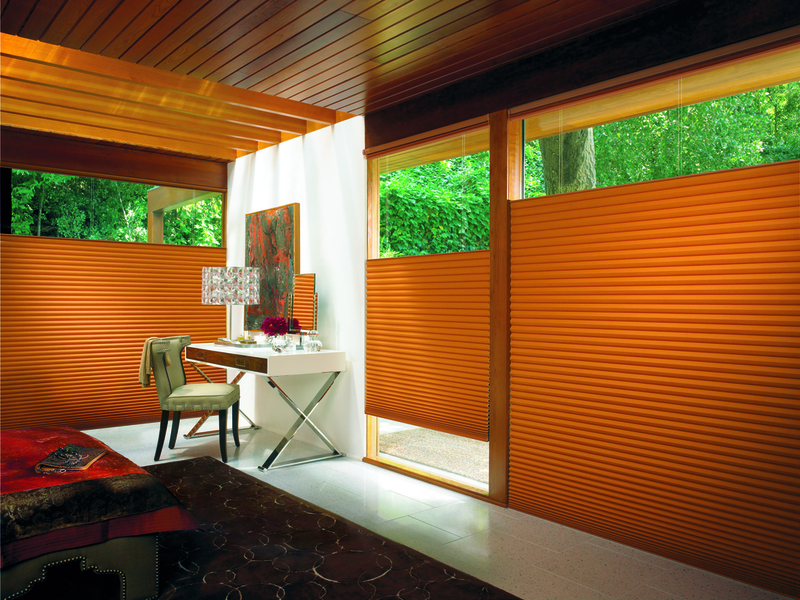 Vertical Application – Honeycomb pleats are oriented vertically and shades open side to side – perfect for sliding glass doors, closed doors, or room dividers. Offered in widths up to 168” and heights of 120”.